PACK A LUNCH SAVE MONEY- DON’T PACK A LUNCH BE PREPARED TO PAY AND BIG TIME! We were packed and ready for family day mini road-trip to a popular theme park in Ontario and YES we packed food and drinks because paying $6.00 for a pop just doesn’t make the budget cut for us. Six Bucks…. almost as horrifying a the cost of a pack of cigarettes ringing in at $17.50 a pack now. No, I did not start up again. You may find that going on a day trip in the summer may increase your food budget because you pack a lunch. If you save money for eating out in your travel fund that’s great but think of how much more fun you could have saving the money and bringing your own food and drinks instead? I know that sounds VERY FRUGAL but we rarely if ever buy food from local attractions because the price is a rip-off. Yes, it is and you know it. No one should have to pay almost $6 for a large pop when that could get you a case of 24 cans. Consider these day trips as if they are a camping excursion but without sleeping over. You really have to think about everything you need to pack from chairs, umbrellas, toys, sports equipment, sunscreen, sunglasses, sun hats, health and beauty supplies, towels, extra clothes, batteries to food and drink in a cooler. The last thing you want to do for a day trip is pack a lunch but what we’ve learned from visiting local attractions and parks in Ontario is that it’s in your best interest financially. The cost of food is not only rising at the grocery store but if you reach into your pocket for convenience just about anywhere you can expect to pay even more. I’m not just talking fast-food, food trucks, cafeterias, restaurants I’m digging deeper into family festivities and day trips with the family where you are already paying a high price-tag for admission. Paying to entertain your family doesn’t have to be expensive and going to theme parks is not a need it’s a want but something we choose to do for little guy as long as our budget permits it. Many of you frugal savers will make your way to local theme parks or other attractions in and around your local area but before you go it’s important to learn the FAQ’s and most of all pack food and drinks before you go. It’s summer and time to be outside for our family which means we make frequent visits to local parks, beaches, nature trails, hiking trails, local farms with play centres, Ontario parks and splash pads in our area. Apart from free outdoor activities and summer festivals and fairs we also like to take the family on adventures at some of the top theme parks and Zoo’s in Ontario. Now that our little guy is a bit bigger we thought we’d give the theme park another shot this year. Back when he was two years old we took him to Wonderland last-minute with friends who invited us and that didn’t work out so well. As first time parents sometimes you learn what works and doesn’t work for your children. Our son did not have patience back then and waiting in line on a hot summer day wasn’t his idea of fun. Although he loved the animal attractions the rides just didn’t do it for him. We didn’t make our way to the splash park because of his grumpy mood and decided we’d wait until he was older until we visited again. What we did do for our visit to the theme park of all amusement parks in Ontario is bring a packed lunch which included lots of snacks and drinks. Personally, as parents we should have done our research before we left to learn more about the theme park but we didn’t. This was our first real adventure as a family so it was more of a learning experience than anything and it paid off just recently after a trip to Bingemans in Kitchener, Ontario. Some of the best theme parks in our area were far too big for our little guy so we went looking outside of the Toronto area for a water theme park that our family could enjoy. 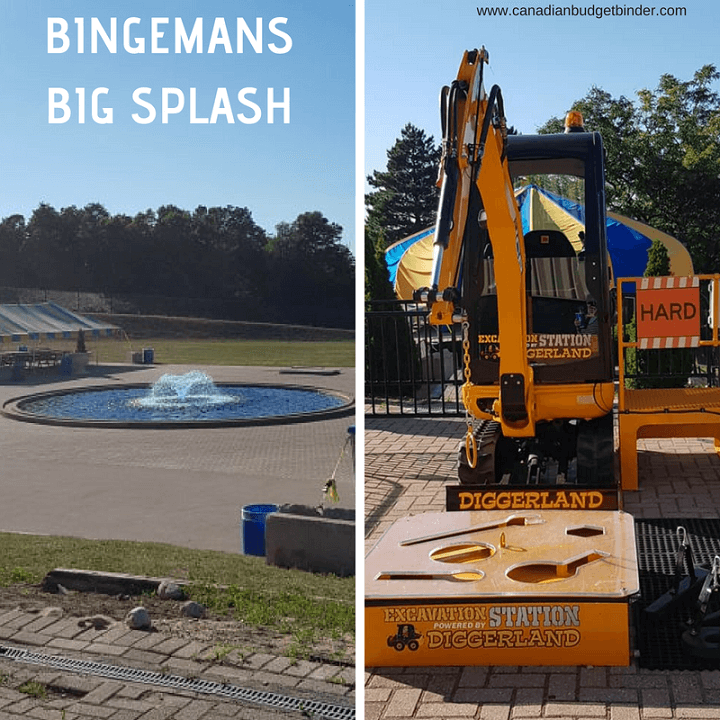 Bingemans seemed like it would be perfect and the website boasted an indoor play centre, Splash park, Diggerland and arcade along with a bowling alley and restaurant. It is a kids theme park built for family fun including the adults. The thing about theme park restaurants is you will pay big money to eat there whether it is a franchise or not. A couple of beers later and a few minutes watching the Soccer match in between our theme park visit cost me $15. That was my splurge for the day but we did frugal our way through discount Bingemans tickets from Groupon for the kids. The 43% savings was a welcome surprise where we only paid $19.95 for the entire day at the water theme park instead of $34.95. There were shocking costs involved with Bingemans although I was not surprised. For one, the Excavation Station by Diggerland was so expensive that we bypassed it altogether. The charge to use one of the machines for the kids run at $8 for 2 short minutes which seems excessive but an attendant has to come out specific for this. There were NO line-ups for this new attraction likely because of the extra costs. The arcade prices are outrageous but luckily we had 2 hour Playdium arcade cards complements of my sister-in-law which provided lots of fun for the entire family. The multi-level play structure is another cost coming in at $10.95 per child for the day and $4.95 under 2 yrs of age. Adults are complementary with a paid child. There is also rock climbing, ropes course and Ball-o-city which is a foam ball blasting station available for a Power Pass price of $20.95 for the day which includes the play structure. If getting a yearly pass makes sense for you budget and family lifestyle then most certainly entertain the idea but for us one or two visits is more than enough during the season. There are SO many things to do in Ontario in the summer we don’t like to limit ourselves besides there are lots of free road trips and parks to visit as well. Either way each theme park, amusement park, park, farm, splash pad, festival and so on all require us to pack food and drinks. YES, we do enjoy some of the local food and drink attractions when the budget permits but we do more sharing than anything. A recent lunch stop at a food truck for Indian food was going to cost me close to $20 for a curry, ouch. I opted to wait until I got home to eat instead but the smells were tempting. List of theme parks popular in Ontario for families not including local zoos, museums, beaches, parks and other attractions as there are SO MANY in Ontario to visit. After securing our discount theme park tickets to Bingemans the next thought that popped into our heads was FOOD and Drink. Can you take food into Bingemans? Thankfully after reading the FAQ’s on the website we were informed that yes we could pack a cooler with lunch, snacks and drinks to enjoy at the park. Yay, so what did we pack? We brought a large cooler filled with ice-packs to keep everything cold that both families prepared for the theme park visit. Our aim was to keep it simple and bring foods that required a small paper plate, forks, napkins and wipes. We always bring wipes wherever we go just in case we need to clean areas along with our hands and mouth before and after eating. 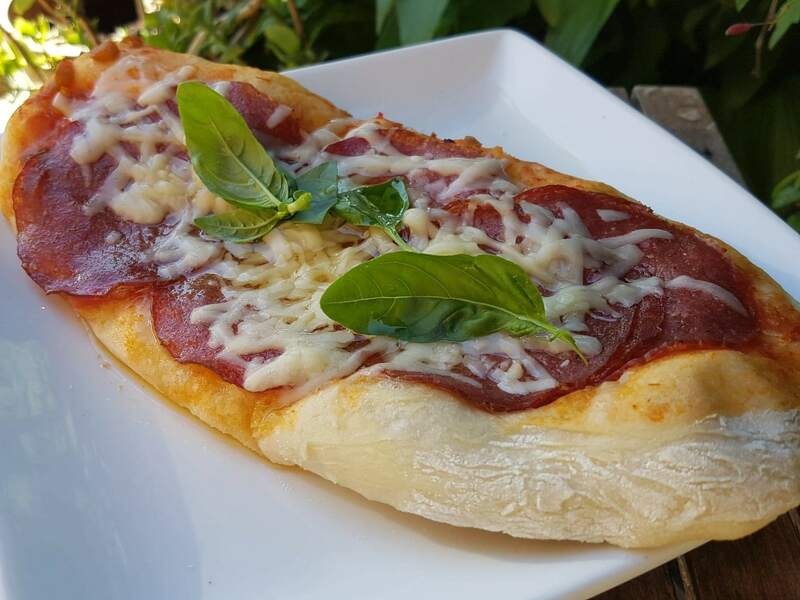 Below are the pizzas we made before we went to the theme park. They were SO GOOD. This was enough food, snacks and drinks to feed all of us for the afternoon until we went home for a BBQ dinner. There were plenty of eating areas around the theme park which made it simple to take a break and then come back for more fun. Had we not gone prepared for the afternoon at the theme park we could have added another $50 for food and drink and then some. 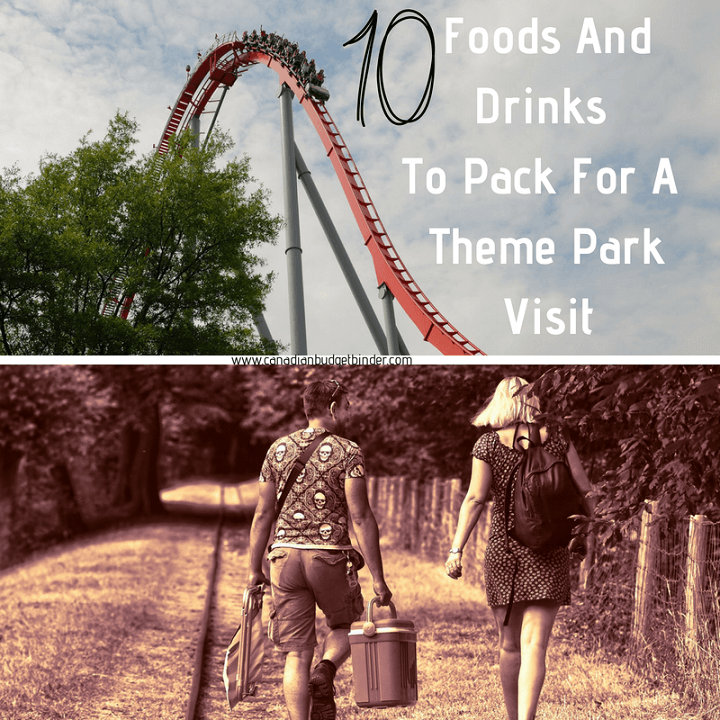 Whether you are going to a theme park or taking a small day trip this summer consider packing a lunch, drinks and snacks to bring along with you. Check with the facility first if you are allowed to do so although some might only allow you to eat outside the facility like at Wonderland which is fine. For picnics outside of the theme park zone just enjoy the day exploring the outdoors and forget about the extra costs of eating out and convenience foods along the way. No line-ups and no extra money being spent. That leaves more time to spend with your family and more money to put towards your next adventure! Our entire day of fun cost us around $100 for the family not including the food we packed although we didn’t buy anything special outside of our weekly grocery shopping. Discussion: What are some of your favourite foods to bring to a theme park or other summer destination day trip? Leave me a comment below, I’d love to hear about your experiences. Well we did spend more than we had anticipated but we were planning a theme park day trip and wanted to make sure we had snacks and food to bring with us. It looks like the next couple of shopping weeks will be thin but we have more than enough to get us by. I’m guessing just fruits, veg and milk will be priority for the rest of our July shopping. Related: Are coupon apps taking over the paper coupons? If you notice I’m missing a valuable link please message me and I’ll add it below. I love this time of year…the tomatoes are so nice and juicy! I shopped a little this week, but we really didn’t need all that much. I expect next week’s shopping will be more substantial. OUR CURRENT TOTAL UNUSED RESERVES ARE $1,792.65. This means the 1,761.30 that we carried forward from 2017 PLUS AN ADDITIONAL $921.39 that we have added in 2018, LESS $890.04 that we have drawn out for use in 2018.